Dogs, cats, horses and livestock are mammals, physiologically rather close to humans and, simplifying, it can be said that when treated with an antiparasitic drug or any other medicine they react very much as humans do. When talking about safety of antiparasitic drugs for domestic animals it must be distinguished between tolerance and toxicity. And within toxicity, it must be distinguished between acute intoxication (or poisoning) and chronic intoxication. For a pet or horse owner, or for a producer confronted with an animal that gets sick after being treated with an antiparasitic drug, it is not immediately very relevant to know whether it is a tolerance or a toxicity issue. But it is useful to understand the differences in order to prevent such cases happening in the future, or to better estimate their seriousness if they do happen again. This article deals with general safety aspects. For more specific information read the articles on the most used antiparasitic active ingredients listed in the menu. Tolerance deals with the way a domestic animal supports treatment with a drug in its final commercial formulation when administered at the recommended dose. Any drug bears the risk of causing adverse reactions or unwanted side effects in a certain number of treated animals, more or less forseeable, even after correct use as recommended. It is comparabe with what happens to human beings. At the correct dose, aspirin is not toxic to humans. But some people do not tolerate it and have to use other painkillers. The same happens to domestic animals when treated with antiparasitics or other drugs. Typical adverse reactions are vomiting, itching, diarrhea, etc. Intolerance does not affect all treated animals, but only a relatively small percentage (usually less than 10%). And not all those animals that do not tolerate a drug show the same adverse reactions. As a general rule, adverse reactions and side effects after correct treatment are less serious than the effect of a real poisoning after an overdose. And they usually disappear a few days after treatment. As it happens to human beings, young, sick, weak and old animals are more likely to suffer adverse reactions because their organisms are less capable of dealing with the drug than strong and healthy animals. Pregnant females and their embryos are often also more likely to suffer adverse drug reactions when trated with antiparasitic drugs. And within the same species, some breeds are often less tolerant to treatment than other breeds. Some antiparasitic drugs can be irritant to the skin or mucosae (eyes, respiratory organs, etc.) and can cause acute severe reactions shortly after treatment. Synthetic pyrethroids are known to be potentially irritant, particularly pour-ons for horses and livestock and spot-ons for pets. A strong irritation can cause violent reactions in affected animals that may become injured, e.g. if they hit against blunt objects. Abortions and premature births can also happen in pregnant females as a consequence of such irritation and the reactions it induces. During product development of antiparasitics and other drugs, manufacturers have to carry out tolerance studies with the finished product in each target species (e.g. dogs, cats, horses, cattle, etc.) to find out which side effects and/or adverse drug reactions may occur after treatment as recommended and at higher doses (e.g. 3x, 5x, 10x the recommended dose). This gives an idea of the tolerance of the finished product in the target species. However, for these studies only a small number of animals are tested (e.g. 16) under the same conditions and mostly of the same breed and similar characteristics (breed, age, weight, etc.). Also during product development, the final formulation used as recommended in the label is tested in field trials in several countries, on livestock and in pets. Field trials on livestock are usually carried out in coimmercial farms, field trials on pets in veterinary practices. Main objective of these trials is to confirm efficacy against the parasites included in the product label under field conditions, but usually safety problems in the form of unexpected adverse drug reactions (ADRs) is also investigated. Altogether, before the product is launched new products have been normally tested in a few thousand target animals. If in such trials ADRs have been recorded e.g. in abut 1 in thousand animals, it is usually classified as not related to the product, because it is not statistically relevant, and it is percieved as not being an issue. Only when >1% of the animals had ADRs the case may be further investigated and it may lead to a label warning for a perticular breed or type of animals. However, after the launch, if 1‰ of the treated animals have ADRs and 10 million animals have been treated, there will be 10'000 animals that had a problem. And it may well become an issue. Consequently it is not possible to really anticipate what will happen when a product is launched and used in millions of animals of completely different characteristics. In fact, it is not unusual to discover only after the launch that this or that breed, or young, or old animals have an increased tolerance problem, or that there is an incompatibility problem with other drugs, etc. This is why nowadays in many countries (e.g. USA, EU) pharmacoviligance programs are a must to monitor such adverse drug reactions and to communicate them to veterinary doctors. And in some cases the manufacturer may need to add label warnings, or change the use recommendations, or even withdraw the product. Most spot-ons are well tolerated by pets. Nevertheless, the concentration of active ingredients in most spot-ons is rather high, typically around 10%. In a few products this concentration can be up to 65%! This is not unproblematic and the risk of adverse reactions and side effects is real, especially for cats and kittens, puppies, small breed dogs and generally for sick or otherwise weak animals. The experience with topical ready-to-use cattle pour-ons (very similar to pet spot-ons) shows that some active ingredients, especially synthetic pyrethroids are often irritant, particularly for calves and dairy cows. Such pour-ons for cattle contain similar active ingredients (e.g. permethrin, cypermethrin) as pet spot-ons, but at much lower concentrations than many spot-ons, typically between 1% and 5%. The dose applied to cattle ranges between 1 and 5 mg/kg bodyweight, whereas the dose of some dog spot-ons with up to 65% permethrin can be >100 mg/kg body weight! A comparable situation occurs with amitraz for cattle and for dogs. There are no amitraz pour-ons for cattle, because cattle just don't tolerate it in high concentrations. Instead there are topical amitraz sprays or dips that are applied to cattle at concentrations of ~0.025% (250 ppm = mg/L), which results in a dose of 3-5 mg/kg body weight. And even at such a low dose adverse drug reactions in cattle may occur. Spot-ons for dogs may contain up to 10% amitraz and can result in doses of up to 45 mg/kg body weight! It is therefore not surprising that more than a few dogs or show serious adverse reactions to such spot-ons. And if they are used off-lable on cats, fatalities cannot be exludes, because both amitraz and synthetic pyrethroids are toxic to cats. Intoxication or poisoning is the consequence of exposure to an excessive dose of a drug, which causes a series of physiological and behavioral reactions depending oh the affected organs and the degree or overdosing. As a general rule, only a few animals will not tolerate a drug used as recommended showing variable symptoms, whereas all animals will show more or less severe but quite similar signs of intoxication when overdosed. Intoxication after overdose is mostly due to incorrect use or accidents. Poisoning and the subsequent adverse reactions depend always on the extend of overdosing. A slight overdose may cause light transient symptoms that do not require treatment. A massive overdose can cause the same but stronger symptoms, or additional symptoms, and may be even fatal if left untreated. And as for tolerance, the type and the severity of the symptoms depend also on each individual: breed, health, age, etc., as well as on the incriminated drug. For this reasons it is not possible to anticipate in detail what can happen after intoxication or poisoning. Toxicity is investigated during the development of any antiparasitic drug. Most studies are run with the active(s) ingredient(s), not with the finished formulation for which tolerance is investigated as previously described. Most studies are standard tests that are required by the regulatory authorities. They include e.g. the determination of the acute oral, dermal or inhalation LD50 (lethal dose that kills 50% of the treated animals) as well and many other acute, sub-chronic (28 days) and chronic studies (1 or 2 years), etc. And most studies are run with laboratory animals (mostly rats, mice, rabbits and dogs), not in target animal species (e.g. cattle, sheep, horses, cats, etc.). For this reason it is usually not known which is the acute LD50 for target animals such as cattle, horses, pigs, dogs, etc. Acute intoxication is the result of exposure (ingestion, contact, inhalation, etc.) to an excessive dose (single or multiple) of a drug during a relatively short period of time (hours, days) that causes more or less severe but rather immediate reactions, i.e. within hours or days. As for human beings, domestic animals can suffer acute poisoning after ingestion, contact or inhalation of and excessive dose of an antiparasitic drug. Overdosing can be the consequence of an administration error (e.g. overestimating the weight, erroneous calibration or the equipment, wrong dilution, etc), an accident, carelessness, etc. As it happens to human beings, young, sick, weak and old animals are more likely to suffer from poisoning because their organisms are less capable of dealing with the drug than strong and healthy animals. Particularly dangerous are concentrates that have to be diluted prior to usage, e.g. those for dipping or spraying with organophosphates or carbamates, which contain highly concentrated active ingredients that can be rather harmful. The same applies to certain old wormers with a low safety margin (maybe 2 or 3): an error in administration (e.g. overestimating the body weight) can easily lead to an overdose and intoxication. The symptoms of acute poisoning of domestic animals are similar to those that occur on humans: pain, sickness, nausea, vomiting, diarrhea, colic, fainting, lameness, etc. They depend on the dose and the active ingredient involved. It can be difficult to notice them on livestock in the field that is not visited daily, but are usually easy to recognize in pets, horses, dairy cattle and other animals that are usually in close contact with their owners or carers. Chronic intoxication is the result of repeated exposure (ingestion, contact, inhalation, etc.) to relatively low doses of a drug during a long period of time (months, years) that causes progressive damage and results in more or less severe effects only after months or years of exposure. This can theoretically happen on livestock and horses with antiparasitics that are used very frequently, e.g. tickicides that are administered weekly during the whole tick season (even during the whole year). Or after using slow-release devices that keep the treated animal exposed to the drug for months. In pets this may happen after years of being regularly treated with flea, tick or heartworm preventatives. Normally such products are safe to use, but long-term damage cannot be excluded for individual domestic animals, particularly if they are not used correctly and chronic administration errors result in chronic overdosing. Most livestock is bread for being slaughtered after 1-4 years of intensive fattening, a too short period of time for developing chronic intoxications. But dairy cows or sheep, horses, pets and breeding studs live much longer and chronic poisoning cannot be excluded. Certain psychosomatic diseases such as those suspected to occur in humans (e.g. chronic fatigue syndrome, dippers' flu, etc.) after prolongued exposure to antiparasitics are unlikely to affect domestic animals and if ever, they would be very difficult to recognize and diagnose. Allergies are a special case because basically they are not due to toxicity or intolerance to the drug, but to a rather unpredictable individual immunological reaction of the treated animal. Antiparasitic drugs can cause allergic reaction on treated animals, but they are rather unusual. However, there are a few special but well-known cases in which strong and life-threatening allergies to antiparasitic treatment can happen. But it is not an allergic reaction to the drug, but to the sudden death of numerous parasites killed by the drug inside the organism of the treated animal. The killed parasites release high amounts of allergens into the hosts' organism that can cause severe and life-threatening allergic reactions. The most frequent case is what can happen to dogs and sometimes also cats infected with heartworm (Dirofilaria spp.) after treatment with preventatives such as macrocyclic lactones (e.g. ivermectin, milbemycin oxime, moxidectin, selamectin). These compounds are effective against heartworm larvae (microfilariae) in the blood. Heartworm infection (Dirofilaria spp) is a common disease in dogs in regions with hot or mild weather. The disease is called dirofilariasis and is transmitted by mosquitoes. It is less frequent in cold regions but can occur there as well. Cats can be affected too. Heartworm preventatives hinder larvae (microfilariae) in the pet's blood to develop to adult worms. But if the pets are already highly infected when treated for the first time, the sudden death of microfilariae releases enormous amounts of allergens that can cause an allergic shock. The following symptoms may develop about 5 hours after treatment: pale mucosae, tachypnea (rapid breathing), dispnea (difficult breathing), vomit, weak and accelerated pulse, weakness, fever and ataxia (uncoordinated movements). Therapy requires shock treatment, including administration of corticosteroids and fluid supply. Another possible complication in dogs treated with heartworm preventatives is that treatment at the therapeutic dose against microfilariae may also kill some adult worms if the pet is infected. Now, dead adult worms or their remains in the heart or in the pulmonary artery can physically obstruct the pulmonary blood vessels with the consequent damage to the lungs, which can be fatal. This means that any dog that is treated with a macrocyclic lactone should be checked for an already existing heartworm infection. If the check is positive, the heartworm infection has to be treated with other specific heartworm products under strict supervision of a veterinary doctor. In horses infected with Onchocerca spp worms, treatment with an effective anthelmintic (e.g. ivermectin, moxidectin) can cause sudden massive death of the filariae, which produces a well known allergic skin reaction (itching, swellings) known as ventral midline dermatitis. In cattle infected with Hypoderma spp larvae (cattle grubs, warbles), treatment with macrocyclic lactones (e.g. doramectin, ivermectin, moxidectin) can cause the sudden death of migrating larvae that release large amounts of allergens in the host's organism, which can cause severe allergic reactions. To prevent this from happening animals, especially calves, must be treated immediately after the end of the warble fly season, but not later than 2 to 3 months before the expected appearance of warbles in the backs. ¿Which antiparasitics are safer, topical spot-ons or oral tablets? Based on the numerous comments found in internet blogs, forums and chat rooms, some pet owners seem to be convinced that topical antiparasitics (spot-ons, sprays, etc.) that are administered externally to the skin of the pet are less toxic, or at least less risky than tablets, pills, pastes or the like that the pet must ingest. Other users are persuaded that the opposite is true. Both are wrong. Because that delivery form in itself says nothing about the safety of an antiparasitic drug for the treated pet. Many of the antiparasitic drugs for topical administration to the skin have to be absorbed into the pet's blood to act against the parasites they are supposed to control. And they are actually absorbed, either transdermally through the skin, or through licking. This is the case for all pet spot-ons containing e.g. selamectin (REVOLUTION, STRONGHOLD), moxidectin (ADVOCATE, ADVANTAGE MULTI) or emodepside (PROFENDER) and of all pour-ons for cattle or sheep containing macrocyclic lactones. Other topical antiparasitic drugs do not need to be absorbed to blood for controlling the parasites, but they are indeed absorbed more or less through the skin or through licking. This is the case e.g. of all pet products containing fipronil (e.g. FRONTLINE), imidacloprid (e.g. ADVANTAGE), spinosad (COMFORTIS, TRIFEXIS), synthetic pyrethroids (e.g. cyphenothrin, etofenprox, permethrin, etc. ), etc. Summarizing, even if they are administered externally, the active ingredients always get into the pet's organism. This is usually not a problem, because the products have been developed to be well tolerated. But they do get into the organism of the pet. In fact, the most frequent cases of severe adverse drug reactions are known to occur with topical spot-ons, not after correct use, but e.g. after off-label treatment of cats with spot-ons approved only for dogs. Antiparasitic drugs that are administered orally in tablets, pills, feed additives, etc. or that are injected obviously get into the pet's organism. There they act against the parasites, but they have been developed too to be welll tolerated and they are usually not a problem. What is true is that oral or injectable antiparasitic drugs for pets, horses or livestock do not expose their owners or carers to the drug, because they never contaminate the animal's hair coat. In contrast with this, topical drugs (spot-ons, pour-ons, etc.) will leave significant amounts of active ingredients in the hair coat of the treated animals. Pet owners and children playing with the pets, or a person riding a treated horse will get in more or less intense contact with the drug in the animal's hair coat. This is mostly harmless, but chronic repeated exposure may well cause some adverse reactions in human beings, particularly in children. The safety margin, also called safety index, is the ratio between the single dose of a medicine that causes no clinical adverse reactions in the target host, divided by the single therapeutic dose recommended. If the recommended therapeutic dose is 10 mg/kg body weight, and the highest dose that causes no clinical adverse reactions is 50 mg/kg body weight, the safety margin would be 5. For practical purposes a safety margin of 5 means that administering twice the therapeutic dose (on purpose or due to an error) should not bear serious risks of adverse drug reactions. With a safety margin of 2, administering twice the recommended dose would already cause adverse drug reactions. It is good to know that in most developed countries the tolerance of a parasiticidal formulation (i.e. a finished product) must be determined for each target animal species (e.g. cattle, or sheep, or dog, etc.). Therefore the maximal dose that causes no clinical adverse reactions is theoretically known for each species the product is approved for. But it is neither determined for all breeds, nor for all ages, nor for all conditions (e.g. pregnant females, young or old animals, etc.). Therefore there is always a risk that particular animals are less tolerant than expected based on the theoretical safety margin. In any case, the higher the safety margin, the lower the risk of adverse reactions. Unfortunately it happens in numerous less developed countries that tolerance studies for generic formulations are poorly done, if at all. Interestingly, whereas for veterinary anthelmintics (= wormers) the safety margin is often explicitly mentioned in the product label instructions or in product leaflets (unfortunately not in all countries), veterinary ectoparasiticides often lack this information. The therapeutic index or therapeutic ratio is another safety parameter. It is the ratio between the single dose that causes the therapeutic effect divided by the LD50, i.e. the dose that causes death of 50% of the animals treated. For veterinary parasiticides the LD50 of the formulation is usually determined only on rodents (rats, mice, etc. ), perhaps on dogs, certainly not on horses, cattle, sheep or other livestock. Therefore it is mostly impossible to determine the specific therapeutic index, or it is done using the LD50 of the active ingredient on rodents, which can be unreliable. There are several situations that often cause overdosing followed by more or less severe poisoning symptoms in a domestic animal. The most frequent ones are described below. This can happen with all concentrates (liquids or powders) for dipping and spraying animals that have to be diluted prior to usage, as well as with feed additives that have to be mixed with food or water. Among them organophosphates and carbamates are particularly problematic because the active ingredients are often rather harmful. Such products are used mainly in livestock, horses and poultry, less in dogs or cats. An error in preparing the dilution can easily result in substantial overdosing and subsequent intoxication. 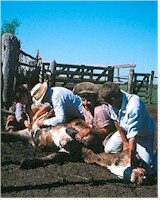 Correct dosing requires very often the correct determination of the animals' weight. An erroneous weight determination overestimating the animal's weight can lead to an overdose that can be risky if antiparasitics are used with a low safety margin (e.g. ≤3). In livestock, incorrect weight may be due to erroneous handling of scales or to incorrect grouping of animals into weight groups only by visual estimation prior to treatment. Even if the weight has been determined correctly, the actually administered dose may be excessive. In livestock, this can be due to wrong calibration or functioning of the administration equipment (syringes, pour-on or drench guns, etc.). In large cattle or sheep farms, where thousands of animals may be treated during one day, it can happen that animals are treated twice if they were not properly marked or otherwise identified or separated after treatment. In pets, the risk of incorrect dosing is real if tablets or spot-ons for large dogs are split and used on smaller dogs to save money (see below). Dogs of some breeds are intolerant to ivermectin, other macrocyclic lactones (e.g. milbemycin oxime, moxidectin, selamectin) or other drugs (e.g. emodepside) that can cross the blood-brain barrier. They can suffer more or less serious adverse effects if treated at dose rates slightly higher than the recommended ones. Consequently dosing must be as accurate as possible. This is the case for Collies and related breeds, which have a mutation in the MDR-1 gene that affects the blood-brain barrier and makes it more permeable to such compounds than in dogs without this mutation. Besides Collies, other dog breeds have shown similar problems, although the MDR-1 mutation has not been confirmed in all of them. The breeds more affected by this mutation are (% frequency): Collie (70%), Long-haired Whippet (65%), Australian Shepherd (50%, also mini), McNab (30%), Silken Windhound (30%), English Shepherd (15%), Shetland Sheepdog (15%), English Shepherd (15%), German Shepherd (10%), Herding Breed Cross (10%). Other less affected breeds are: Old English Sheepdog, Border Collie, Berger Blanc Suisse, Bobtail, Wäller. The only way to be sure that a dog is affected or not, is to test for it. As more dogs are tested it is likely that the mutation is discovered in other breeds, or that the frequencies change. For a dog without the MDR-1 mutation, the ivermectin dose that does not cause adverse drug reactions is ~2000 mcg/kg body weight. In contrast with this, for a dog monocygotic for the MDR-1 mutation the highest dose that causes no adverse drug reactions may be as low as 60 mcg/kg body weight, i.e. about 30 times lower. Storage conditions before or after sale can substantially affect product stability, even in unopened containers (bottles, cans, spot-ons, blisters, etc.). Much more if containers are opened and some unused product is left inside for future use. As a general rule, very high temperatures (>30°C) and extreme day-night temperature changes have the highest impact on product stability. In regions with very hot climate it is not unusual that products are stored well over 30°C for weeks or even months: e.g. during transport or during storage in barns, farms or warehouses that are not properly cooled. And day-night temperature changes can be also very high in such regions. Such storage conditions can accelerate break down of antiparasitic drugs. For most drugs, if the active ingredient breaks down, the resulting molecules are not substantially more toxic than the original compound. But for organophosphates or carbamates the risk is real that they become more toxic. Keeping unused product in unopened containers for future use always bears additional risks of premature product deterioration. The reason is that product remains in an opened container are exposed to much more air and humidity and other potential contaminants than the original product in the sealed, unopened original container. Take e.g. a 5 L container. An unopened container has e.g. 5 L product and perhaps 20 ml air (oxygen, humidity, etc. ), i.e. a 250:1 product/air ratio. If 4 liters are used after opening and 1 liter is left and stored for later use, the product/air ratio has dropped to 1:4. This is a tremendous difference with the original product. The amount of air is now about 1000 times higher than in the unopened container. Needless to say that this can substantially influence product stability. The same happens e.g. in pipettes for large dogs if they are opened but used several times for smaller dogs and stored opened during months. This is a good reason not to do it, in addition to the high risk of incorrect dosing. A comparable situation must be expected for solid products (tablets, pills, etc.) once taken out of the blisters. Inside the blisters they are protected from air and humidity. Once outside, they may absorb air humidity, which can significantly affect their consistency and/or palatability. Or microbes (e.g. fungi) may develop inside and spoil them, particularly if they contain some sugars or food extracts (e.g. in chewable tablets for pets). If once out of the blisters such tablets are splitted in two or more pieces that are stored exposed to air for days or even weeks, these processes may run faster. You better don't do it. Unfortunately, off-label use of pet spot-ons and tablets is very frequent, partly due to the fact that they are rather expensive, particularly for multi-pet households. Spot-ons or tablets for large dogs are purchased for multiple use on small dogs or cats. There are several risks associated with this practice. Not everybody is sufficiently instructed and equipped to correctly calculate the dose for smaller animals and/or to accurately administer it to the pet. In addition, for some products dose reduction for lower weights is not linear, and the recommended dose for cats may be different than for dogs. And when unused product is left in opened containers for later use, the risk that the product breaks down is real, and it cannot be excluded that the break-down products are more toxic than the original active ingredients. On top of it, some products approved for dogs are not approved for cats because they are toxic to cats: this is particularly the case for products containing amitraz and most synthetic pyrethroids (e.g. cyphenothrin, etofenprox, permethrin, etc.) that are toxic to cats because cats lack the enzymes that break down these compounds in their organism. In fact, off-label use use of such spot-ons for dogs in cats is the most frequent cause of cat poisoning in many places. In rural areas with easy access to livestock antiparasitics, the temptation to use a small amount of those not too expensive livestock products on dogs, cats or horses is understandable. Sometimes it works well without significant adverse effects. But the risk of trouble is real. Since many livestock products do not include instructions (dilution rate, volume to administer, frequency of treatments, etc.) for use on dogs, cats or horses, correct dosing is difficult if not impossible and the risk of overdosing is real. Experienced veterinary doctors are usually capable of providing advice on this matter. And don't forget that amitraz is toxic to cats and horses, and synthetic pyrethroids are toxic to cats. This is even more risky than using livestock products on pets. Even if the active ingredients in the crop pesticides are the same as those used in pet or livestock products, e.g. fipronil and imidacloprid, two ingredients that are used a lot both in crop pesticides and in spot-ons for pets. The reason is that such crop pesticides do not include instructions (dilution rate, volume to administer, frequency of treatments, etc.) for use on pets, horses or livestock. And the solvents they contain have been selected for being used on plants not in animals: it cannot be excluded that they have toxic or irritant effects for domestic animals. In this case not even the advise of veterinary doctor is reliable. Unfortunately, not only luxury watches and perfumes are falsified. Fakes of veterinary drugs are not uncommon in many less developed countries, and they may find their way to higher regulated countries, e.g. in bordering regions. In the best case such fakes do actually contain the same active ingredients as the genuine products and provide some control. In some cases they contain nothing but water or other useless ingredients. This will result in inefficacy of the product leading to increased harm to the treated animals caused by the parasites that remain uncontrolled. In some cases they may be both ineffective and toxic. A way to recognize the fraudulent origin of a veterinary product is carefully observing content, packaging and labels (smell, consistency, form, color, etc.) and comparing it with genuine products. Serious manufacturers sometimes include design details in the labels or containers that are difficult to copy. But not always or not everywhere, because they may increase product costs. Best is also to buy from well-known and reliable suppliers and to mistrust offers from unknown sources offering unrealistic prizes. You wouldn't buy a ROLEX watch for 100 USD in a flea market and expect that it is a genuine ROLEX, would you?